The Loadstar 500kg LV Motor has been used in across the globe from outdoor concerts in to the best performances on Broadway. 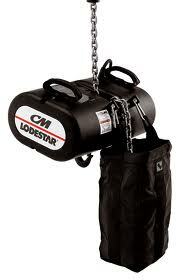 The CM Lodestar Electric Chain Hoist provides unsurpassed performance, lifting and positioning sound equipment, trusses, lighting grids, graphic panels literally anything used for your show, where you want it. Production Hire own a state of the art Loadstar 500Kg LV Motor 10M for dry hire to support your live music event. Call or contact us for your free no obligation quote regarding Loadstar 500Kg LV Motor 10M dry hire. One of the Production Hire team will be happy to help.